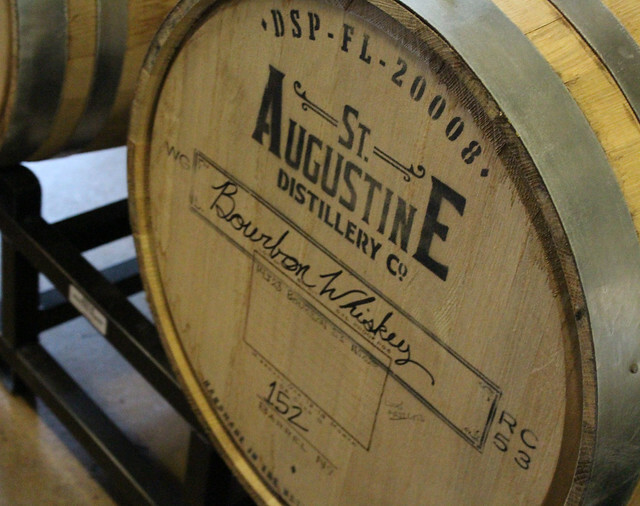 St. Augustine just celebrated 450 years. By American standards, that’s a really long time. So in honor of the big 4-5-0, I’m revisiting my guide to the Ancient City that I started nine months ago (life apparently got in the way). It sits slightly on the outskirts of downtown (though if you walk from downtown, check out all the cute vintage shops along San Marco Avenue) but worth a visit. 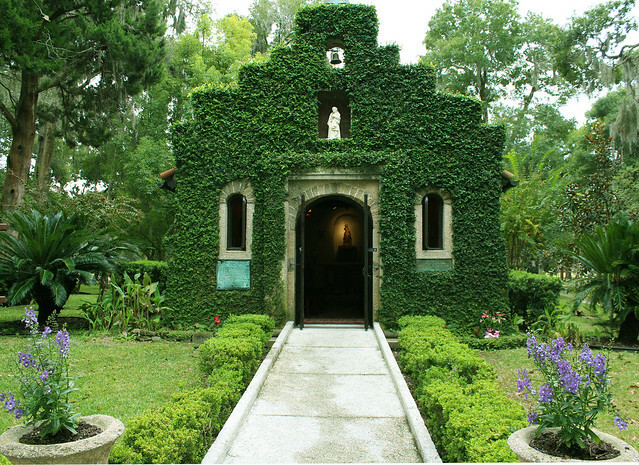 It’s an Spanish Catholic Mission run by the Roman Catholic Diocese of St. Augustine and is free to check out (donations suggested). 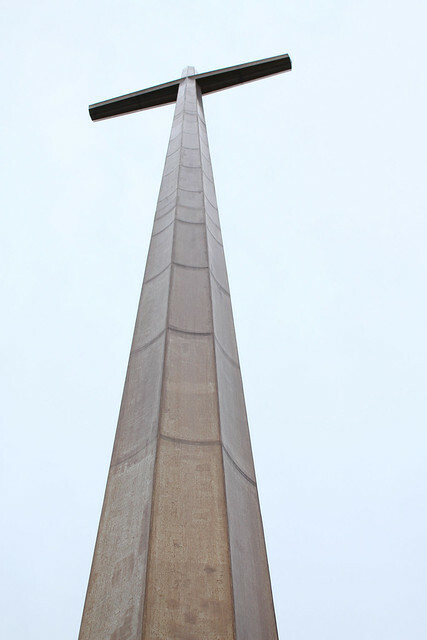 The main highlight is the GIGANTIC bronze cross that rises 200+ feet into the air. 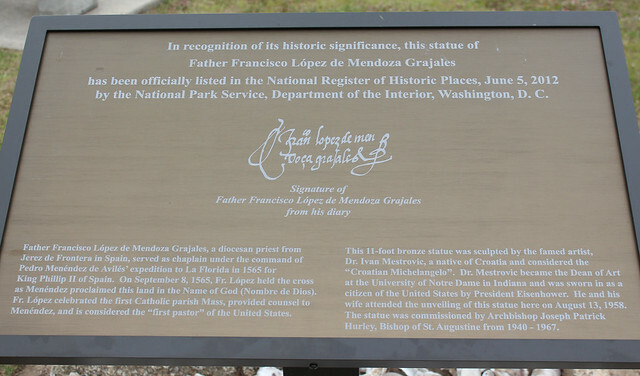 As you head towards the Matanzas River, you run into Father Francisco López de Mendoza Grajales, chaplain of city-founder Pedro Menéndez’s fleet and one of the first of the city settlers to set foot in what is now St. Augustine on September 9, 1565. 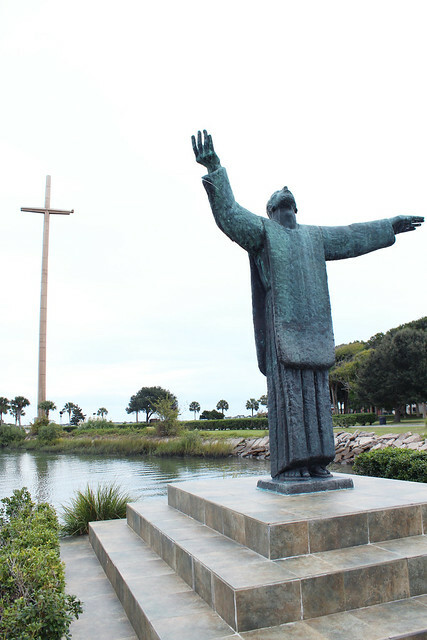 Rising up behind Father López is the Great Cross is supposed to be a beacon of faith for all those that pass by. Two-hundred and eight-feet high, it was completed in 1966. 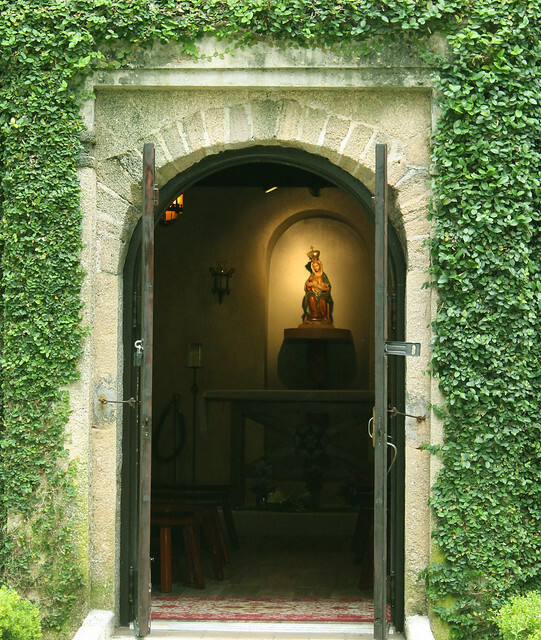 My favorite part of the grounds is the lush green Chapel of Nuestra Señora de La Leche y Buen Parto (Our Lady of the Milk and Happy Delivery) that sits just beyond a graveyard. 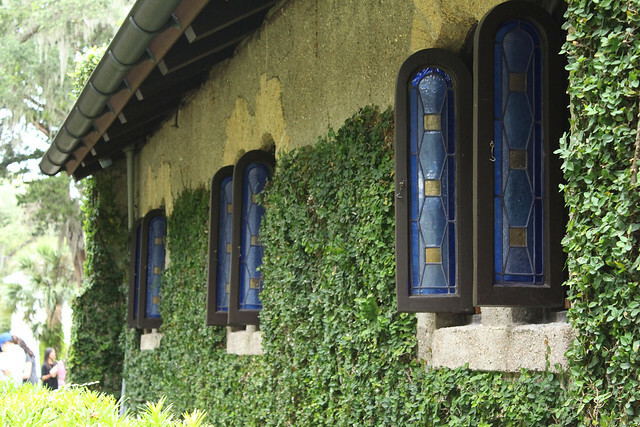 It was built to reflect the Spanish mission style of the 1500’s. If you feel inspired, you can light a candle in the shrine. We opted to admire it from afar the day we went. This was our first stop on our first trip to St. Augustine, mostly because we were scoping it out as a potential wedding venue (or at least I was). 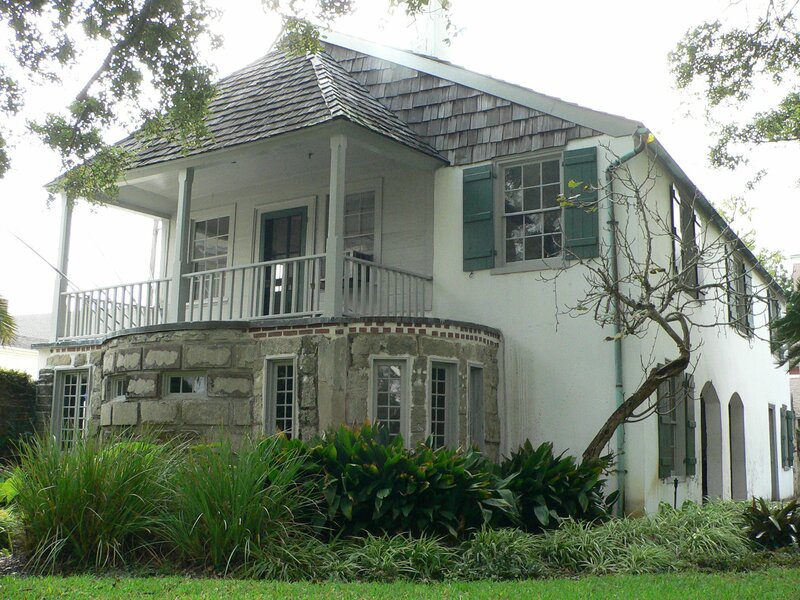 The spot, owned by the St. Augustine Historical Society, is the oldest surviving Spanish colonial dwelling in Florida. 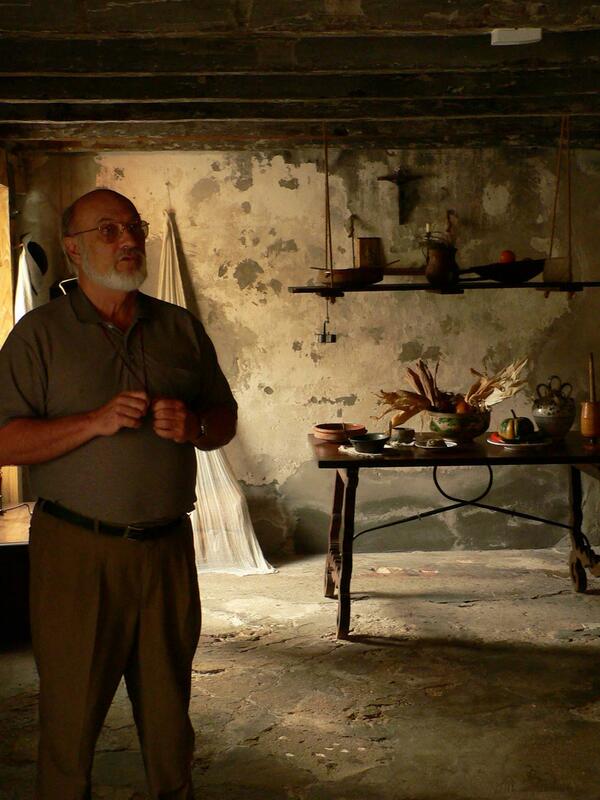 The house itself is pretty cool if you like history — it shows how people lived long ago. There are tours of the house, a museum on local history and the gorgeous gardens — the latter being my favorite part! 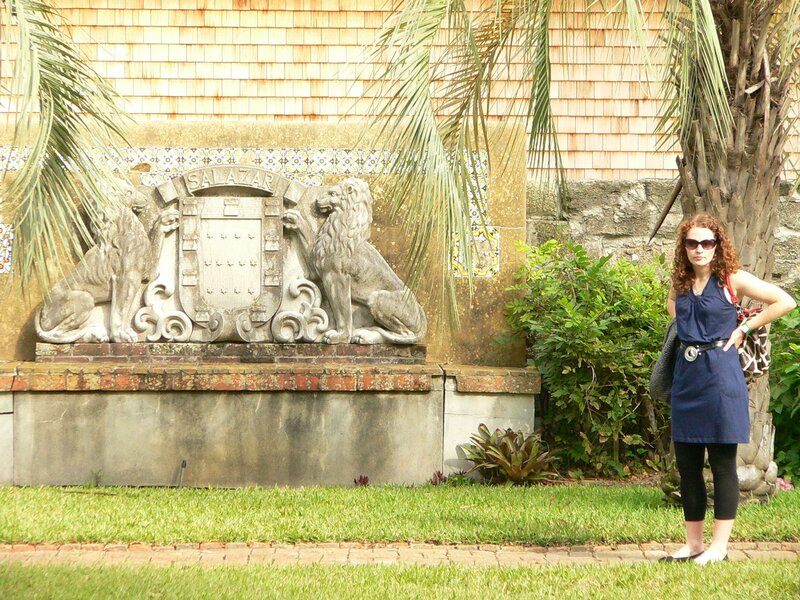 While we didn’t end up getting married here (we got married across the street at the Llambias House, another St. Augustine Historical Society building), it’s still worth a stop in at least once, to take in the majestic oaks and little features that make it such a cool spot (like a small kitchen building and the lions below). 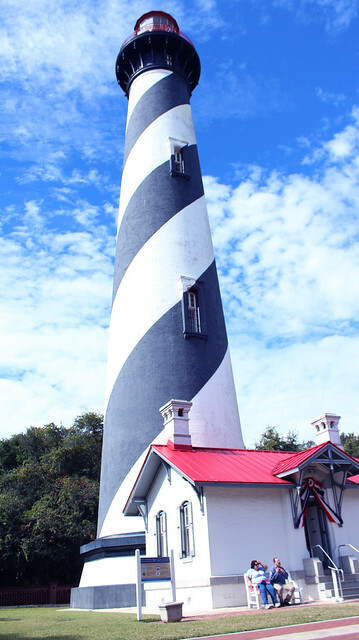 The black and white swirl of the St. Augustine Lighthouse rises above the flat lands of Anastasia Island, making this iconic structure not just visible from sea but from numerous bridges and landmarks across the city. It’s the city’s oldest surviving brick structure, dating back to 1888, a replacement to lighthouses long gone that were built in far more flammable materials (like wood) or too near the shore (those waves are relentless when storms hit). 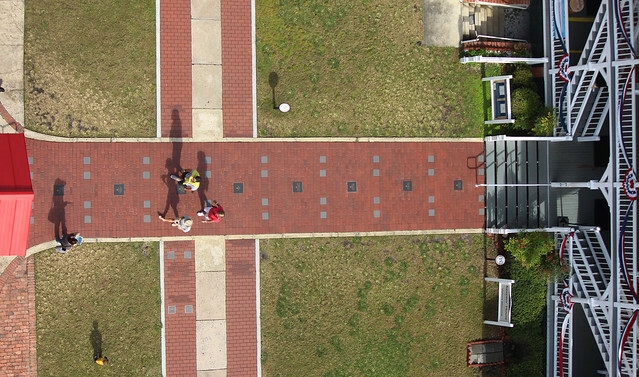 It’s not quite as tall as the Great Cross, rising to 165 feet, but it’s still a long way down! The 219 steps and open ledge are slightly harrowing if you’re not a fan of heights (like me), but are still doable and worth the effort. 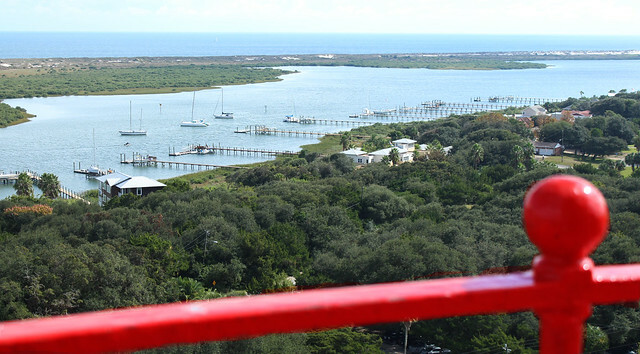 The view can’t be beat no matter which was you look — a sailboat-lined river, the ripples of waves in the ocean, the landscaped doted with homes and historical buildings. Covered in detail here. One of the newer gems in St. Augustine. Also, free. Besides the Spanish, Henry Flagler was king in this city. 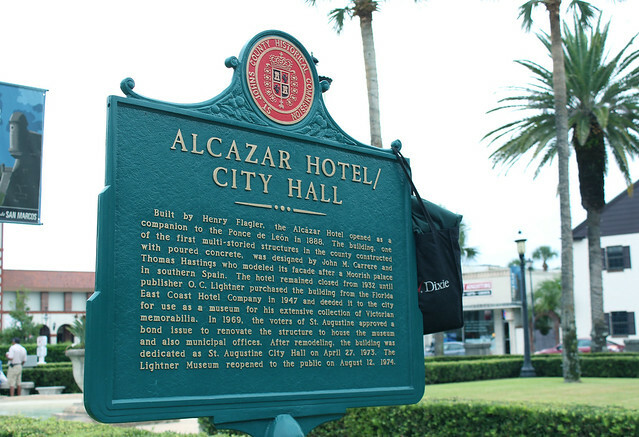 There’s the Lightner Museum, which Flagler opened as the Alcazar Hotel in 1888. The railroad magnate built the hotel to appeal to people who headed south for the winter. 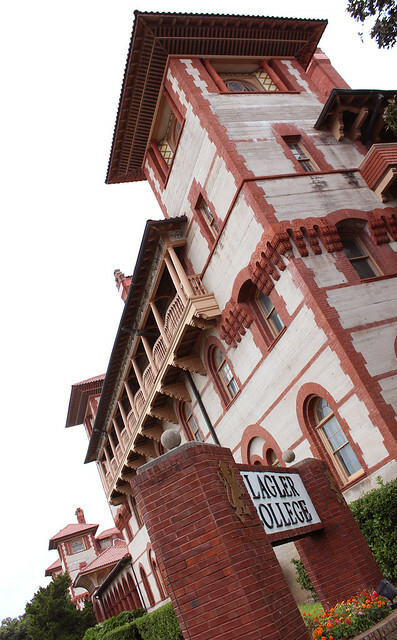 Across from the Lightner sits the campus of Flagler College. 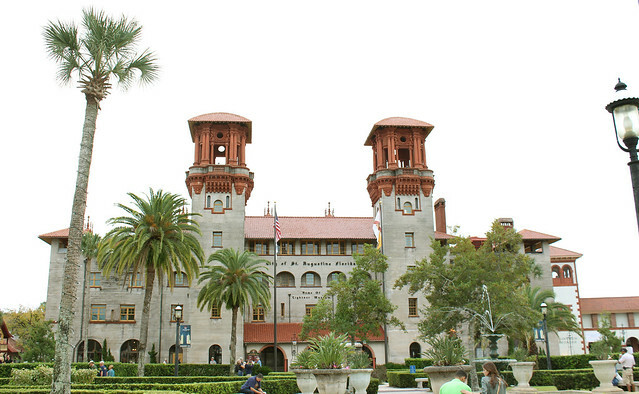 Flagler built the Ponce de Leon Hotel in 1888, which is now part of the college campus. 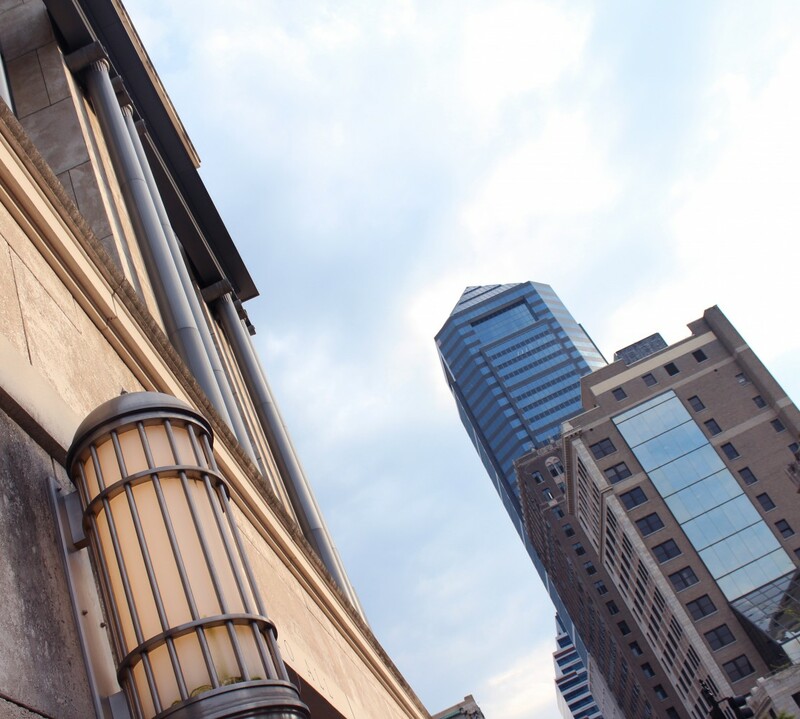 The Spanish Renaissance Revival buildings are still beautiful, 100+ years later, and give the area of the city a distinct look. Clearly there is plenty to see in St. Augustine. Coming soon: where to eat and stay! Yea, I know, those aren’t the words. The song’s about the Chattahoochee, not the Ichetucknee (although they don’t sound that different). But rolling down the slow current in a tube, we couldn’t help but recall Alan Jackson’s ode to a meandering southern river. Except the Ichetucknee water ain’t muddy like the Chattachoochee.